Bourbon Street, Mardi Gras, Jazz & Blues tunes along with Cajun & Creole food are what makes New Orleans the vibrant city that it is. Chef Sohan now brings a slice of that experience to Goa with the Bistro Bourbon Street. If you have never tried any Creole or Cajun food, then this is your lucky day, as Chef Sohan has the best there is to offer at his little Bistro. It is located in a modern complex, instead of a house or shack by the water, and has maybe just 3 tables inside, but do not let that discourage you. What it may lack in surroundings, it more than makes up with it’s food, the music, Chef’s Sohan’s conversations and the overall ambience. 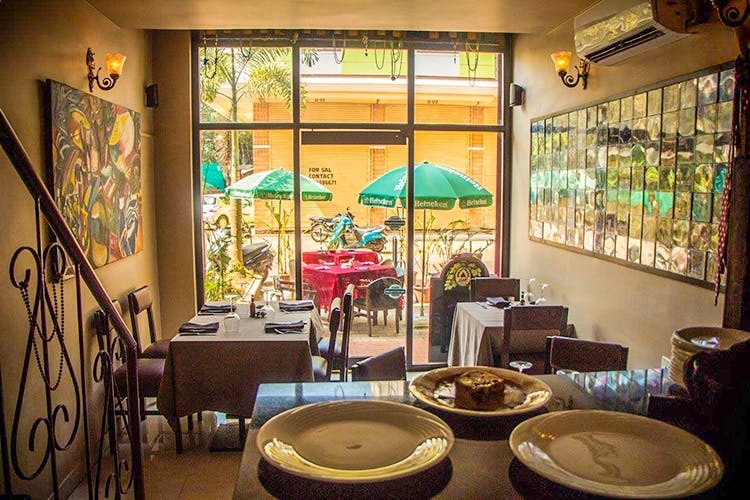 Tucked away in Candolim, in one of the by-lanes behind the Fortune Acron hotel, this bistro serves food that is not available pretty much anywhere else in Goa if not India. We were actually loathe to share this cute little Bistro with anyone, as Sohan makes everything himself and with fresh meat daily. But you know what they say, good food should always be shared, and so we have done our good deed for the day. Food, food and glorious food is what we liked here. So we dived straight in for some Southern Fried Chicken and Barbequed Cajun Prawns, which were cooked to perfection. We were mopping of the Cajun sauce with that lovely warm Poi and Pao they offered in the breadbasket. The chicken was tender, with that crispy batter fry and a delicious sauce drizzled over it. For mains we ordered the Bourbon St Cheeseburger that came with meat grilled to perfection, real cheddar cheese, grilled onions, pickles, thick potato wedges and their tasty ketchup that is also made in-house. Then the classic Red Beans N Rice is what we went for next, which came in this traditional red sauce with chicken, beans, veggies and Cajun spices that teased us with it’s aromas before the dish was even served to us. They of course also have Gumbo & Jambalaya, two of the most well-known dishes amongst New Orleans food and definitely worth tasting here. Nothing really, except for maybe wishing that it was by the waterfront. It is definitely better to book a table in advance since they have very few tables, and especially if you are going in a large group. And for you fussy eaters, be warned that you should not expect any changes or variations to the menu, as the Chef is all about giving the authentic New Orleans gastronomic experience. So don’t even bother asking for your Butter Chicken with Naan. They even have a cute bar upstairs if you want to hang about after or your meal to just listen to some great music from some unheard of local bands from New Orleans playing on their system. Of course, the desserts are again a delight. Be it the fresh bananas cooked in Whiskey & Caramel called the Banana Fosters, which is another traditional dessert. Or try their Cardamom Bread pudding, another classic New Orleans dessert served with rum and ice cream. Or just place a pre-order for his classic New style Cheesecake which is only available by ordering the full cake in advance, and worth every penny especially since you get to even doggy bag it if you don’t manage to finish it there. It is only open for diner from 6pm till 12am and closed on Mondays. For more details check here. And this Bistro is shut during the Monsoon months from May till September.